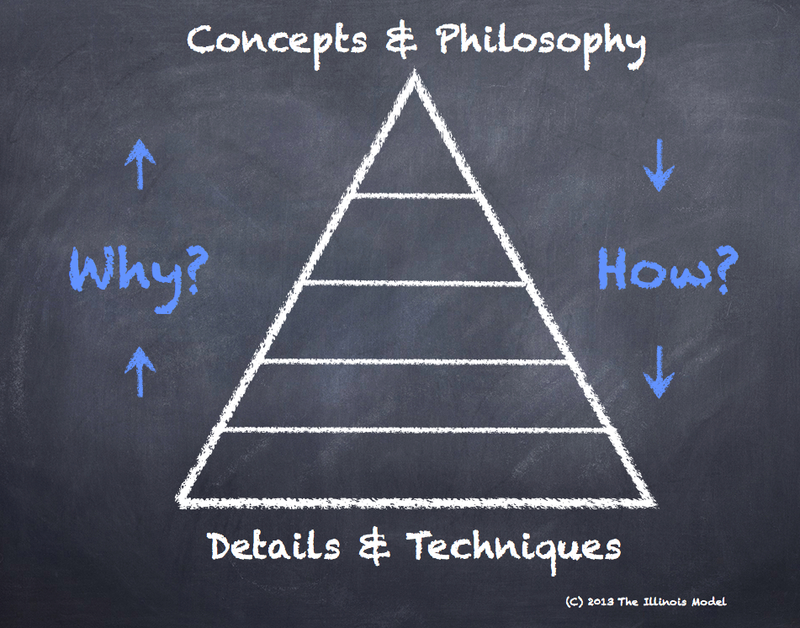 Tactics' Most Important Questions: Why? and How? Why? probes the reasoning or purpose behind a decision or action. How? looks for answers regarding implementation or planning. Where are the answers to How? and Why? In the case of Why?, the answer will be more conceptual or philosophical. Continued questions of Why? lead to answers of more importance and greater significance. For How?, the answer will be more concrete or detailed. Continued questions of How? lead to answers of less importance and diminished worth. Q: Why does a car need a water pump? A: Because it moves water (or coolant) around. Q: Why does a car need to move water? A: Because the water has to move from the engine block to the radiator. Q: Why does the water need to move from the engine block to the radiator? A: Because the water needs to be cooled off. Q: Why does the water need be cooled off? A: Because it's too hot. Q: Why is the water too hot? A: Because it absorbs heat from the hot engine. Q: Why does the water need to absorb heat from the engine? A: Because the engine cannot be allowed to get too hot. Q: Why can't the engine be allowed to get too hot? A: Because the engine will breakdown and not run anymore. So through a string of Why? questions, the answer to "Why does a car need a water pump?" is that because without one, the engine won't run very long. Except for one little problem. Not all car engines have water pumps.....or water....or radiators. (I owned such a car with an air-cooled engine.) Actually, the REAL answer to the question is that cars do not need water pumps; they need methods to keep the engines from overheating. And a water-cooled system that uses pumped water is a very popular method to accomplishing this goal. Q: How will our company make money? A: We will sell products at higher prices than it costs us to acquire them. Q: How will we sell lots of these products? Q: How will we have a marketplace? A: We will open a store where customers can come to see/learn about our product? Q: How will customers see/learn about our product? A: Employees will explain the product's uses and features. Q: How will the employee explain the product? 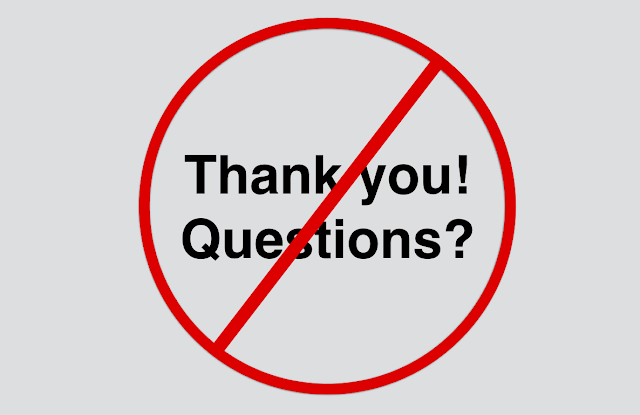 A: They will approach customers and offer help, or be accessible/approachable for customers. Q: How will we make our employees approachable/accessible for customers? A: We will identify them as employees. Q: How will we make our employees distinguished from customers? A: The employees will wear a uniform shirt. It's ignorant to answer "How does our company make money?" by answering simply with employee uniforms. And actually there are lots of ways to distinguish employees from customers: name tags, smocks, aprons, hats. But "selling products at a profit" is a pretty good answer to how do we make money! So what's more important? Company profitability or uniform shirts? Water pumps or keeping an engine cool? 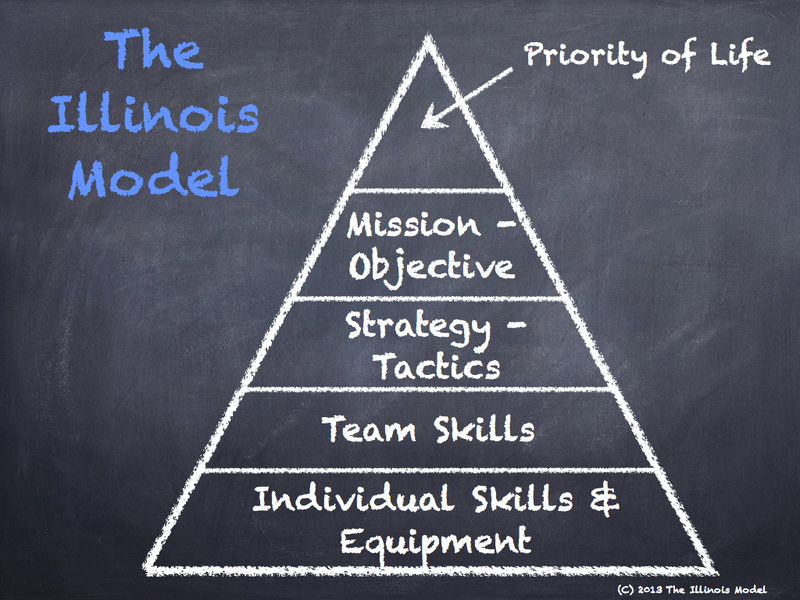 The Illinois Model™accounts for answering two of these most important questions that arise during any evaluation: How? and Why? The answers to Why? 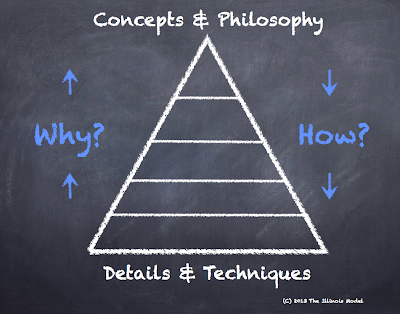 questions are found in the tiers above a questioned aspect. The answers to How? are found under. In the SWAT realm, there are two main tactics for performing a covert or stealth search of a building for a hiding person. One option is to creep along with a shield-and-mirror team. The other option is to use small cells of officers to protect each other while slowly "slicing the pie" at each doorway. So this creates a debate in the Team Skills tier: Which method to use? I guess the first question to ask those groups who use each is.....Why? For each group (those who use shields-and-mirrors, and those who do not), the answer is pretty much the same: Because we believe it to be the most effective and safe way to accomplish a covert entry search. But one thing is for certain. These two groups agree that tactical teams must have a method of performing a covert entry search. Both these groups also agree upon the Priority of Life, the Mission, and the Strategy. 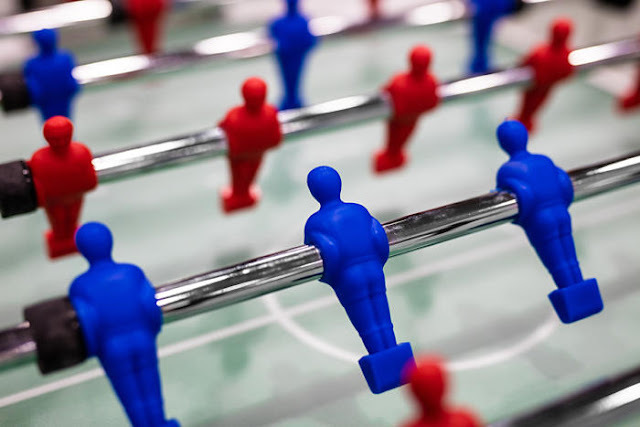 The disagreement doesn't surface until the Tactics meet the Team Skills. These two groups share concepts and philosophy. They disagree on details and techniques. Isn't this a much better condition than two team who share techniques but argue about fundamentally important operational concepts and philosophies? One of the most hotly debated topics in tactical policing is on the methods to serve high-risk warrants -- like those warrants for illegal street drugs, or illegal guns, or wanted fugitives. In the case for an arrest warrant on a known fugitive, known to be inside a specific home.... the debate rages. Arguing teams do agree the mission is simple: arrest the fugitive. 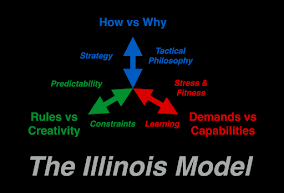 However, at the Strategy-Tactics tier of The Illinois Model, there are two completely different answers. Some teams use dynamic raid maneuvers, like those used for hostage rescue. Other teams begin with a surround-and-callout, hoping the offender simply surrenders to the officers waiting outside. With one strategy, the offender may be taken into custody within minutes; with the other, the situation might turn into a protracted hours-long standoff. Teams on opposite sides of the debate agree on the Why? the team is taking action. They vehemently oppose each other on the How to accomplish that shared objective. 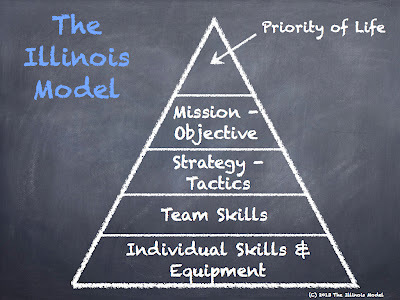 The layered tiers of The Illinois Model prioritize some of the different aspects that frequently spark debate in the tactical policing community. When tactical police officers evaluate their plans, missions, techniques, equipment, and tactics by using the two questions of Why? and How?, they gain a better understanding of the justification behind their decisions. But they also may find value in other methods to reach the same desired outcome. We all know the answer "because we've always done it that way" never satisfies the asker. By asking these two questions, teams and officers can better determine where they agree, where they disagree, and make new discoveries. It also allows those answering the questions to see the big picture and to explain the legitimacy of and reasoning behind police actions. The How? and Why? examination is a healthy way to brainstorm new solutions to old problems. This is a thinking man's game. And these questions make one think. Louis Hayes is a systems thinker for The Virtus Group, Inc., a firm dedicated to the development of public safety leadership. 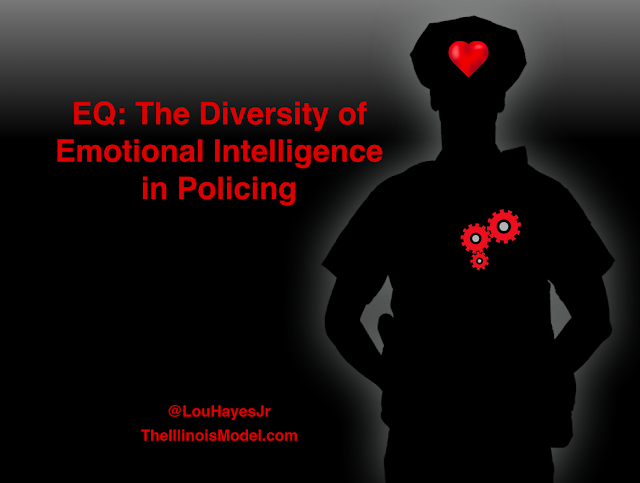 He is a co-developer of The Illinois Model law enforcement operations system and moderates several courses rooted in its theory and concepts. He is a 17-year police officer, currently assigned to a multi-agency tactical unit in Chicagoland. He does not bust down doors to rush in to arrest wanted fugitives...and refuses to change his mind regarding such. A full compilation of articles on the model can be found here. Follow these ideas on Twitter at @TheVirtusGroup.